About 20% of Bab al-Nayrab & Al-Ballaat with the key National Hospital site that used to be the terrorists’ headquarter in eastern Aleppo. Having said that, the terrorists will by any means continue to consolidate during their retreat and improve their defenses. The tighter the pocket, the fiercer the fight, and recent events are leading us to believe the terrorists last stand to be in the southern/southeastern part of the pocket; see map below. Syrian Red Crescent (@ICRC_sy) has installed 26 water tanks to provide clean water to 10,000 people in the skeletal buildings in the Al- Hamdaaniyya district. We cannot end this article without saying good bye to two more NWO leaders that supported the terrorists in the war of aggression against Syria. These two, instead of protagonists were simply stooges of the sycophantish type. But here they go while President Bashar Al-Assad sees them falling into the dark abyss of history. Note: Ziad will also be saying goodbye in the usual manner very shortly. 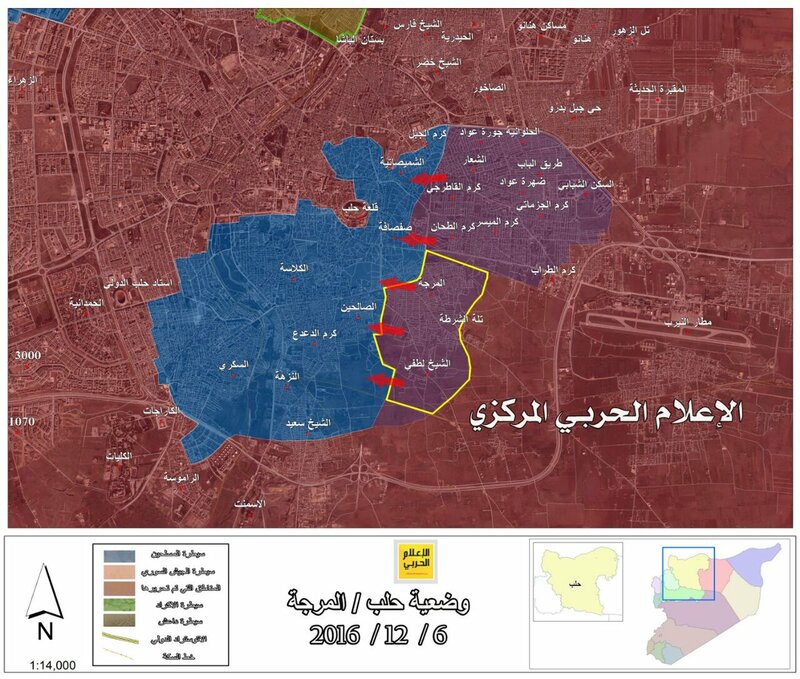 Al Shaer area is completely captured! The rats are done for! Why is Russia so hesitant about vaporizing nato trainers? Should be the first target. Same thing we saw in Ukraine. Of th 10 green buses there all with blinds no Ukrainians were on them. This is surely a de facto declaration of war – the arming of insurgents in a sovereign state. Syria ought to export some reciprocal violence – by air or sea- to Qatar. An official from the Syrian Ministry of Defense: Al-Shaar, Al-Qartaji, police hill under control. May the smell of liberation be a blanket, to comfort you during cold winter nights. Victory is near, so near. Looks like ammo is more desirable than Virgins right now for a terrorist ratfink. I also seen where the us/uk is considering an airdrop. that would be their first mistake after treading on thin ice giving coordinates for killing Russian doctors. Interesting point in this battle to say the least. KEEP HAMMERING SAA before they can decide what to do. No help from Qatar and Saudi Assholes! God will send them to hell, but I will send them to god– Putin. He is diligently sending them en masses to almighty for the best treatment in hell. They wait for Muhasini to be the guest of honor at deep end of hell. Pro-Assad advance in East Aleppo? Yes — al-Shaar latest district to be taken. Life as normal? Umm, no and probably never, except maybe for “reliable” people eventually moved in there. The sharp-eyed will notice that the photos are publicity pix — keep looking for sign of any residents. The Wahhabi-Western stranglehold on Aleppo is almost over. Aleppo will be fully liberated before Obama is out. Syria will present incoming Trump a fait accompli. Neocon/neolib warmongers in the US and EU will fart bricks. it is good to see the rubble being cleared away. soon the reconstruction will begin. many saa soldiers whose nerves may be fraying can find healing in construction instead of destruction. naturally after the last mercenary-rat-terrorist has been expelled. to recronstruct has to be a choice, some of the soldirs may like to take a two year nap. Thanks for the update Canthama, great to see the SAA are still doing a fine job. Those clean up crews look fast as well, it will be a help for the residents. I just hope no terrorist western countries will get any contracts for building or trading, better to have Syria in the Eastern block. I do enjoy this new posting format, we get to pass all sorts of info about now, a news exchange. So even when there are no new stories we still see a lot. The SAA should have a group of 200 combat engineers for the Aleppo area to defuse and dispose of IEDs and booby traps. They are down to 16. They are doing a truly epic job. Just now, mass surrenders to the Syrian army in Nusra areas north of the citadel. Only few southern neighborhoods remain in Qaeda hands. KEY is a money trader. He understands the trade. The dark arts. His job was to change NZ society from default socialist, to default capitalist. Almost done. A few million people murdered in other lands, by international capitalism, is food for his table. However, the trades have shifted.. Surrounded by sycophants and idiots, he looked about. The terrorists in Al-Farafrah, Karm Al-Jabal, Bab Hadid and Afion in east Aleppo have surrendered. 85% of the Aleppo kessel now under SAA control. A few diehards from Jaysh Al-Fatah are holding out in Sheikh Sa’eed, Sheikh Lifti and Marjah, but they will be mopped up in the next few days. A great day for Syria, and for all of mankind. God bless the SAA and their brave allies. December 6, 2015, Late Day . . . | 2012: What's the 'real' truth? Rebel sources confirm that factions operating in eastern Aleppo have now agreed to pullback completely. 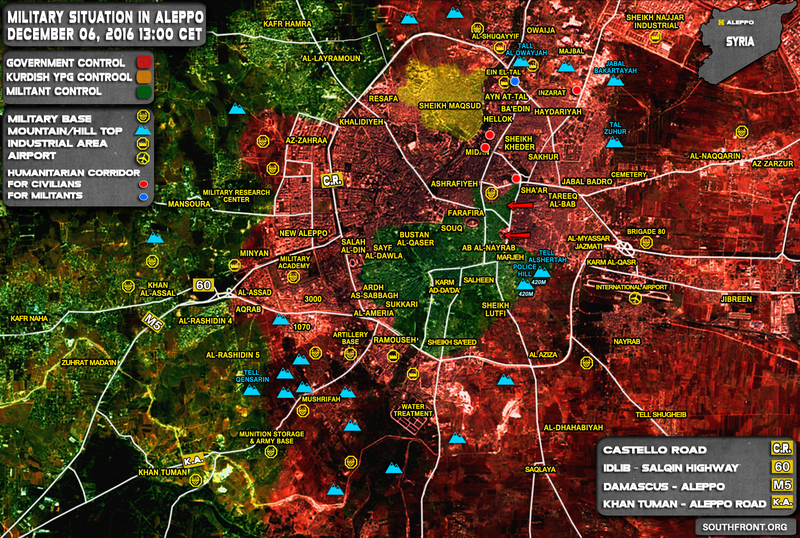 Aleppo has fallen to the SAA. Twitter is full of tweets of how the SAA have essentially taken Aleppo. The war in Syria is over in the sense that everyone knows Assad will stay leader and the attempt to overthrow him has been crushed. Now there remains some anti-insurgency operations for Idlib and elsewhere. Syria’s army and allies closed in on areas near Aleppo’s Old City on Tuesday, looking closer than ever to achieving their most important victory of the five-year civil war by driving rebels out of their last urban stronghold. I never stopped believing in the Syrian Army and the Syrian people. Even in the darkest times, I knew they would never stop fighting. So many people not buying MSM any more, in USA and in Europe. In my country, the most popular portal announced today “the girl from Aleppo is alive” and soon the article was followed with 20 angry comments about Goebbels, cursing the news agency, f… England, etc. Amid Jihadist collapse in Old Aleppo, the SAA liberates the Umayyad Mosque. Heres to a free and liberated Aleppo. Thanks for the great news and updates. Arrivaderci to Vales ,Holland, Renzi and soon to Merkle . Thats what I call cleaning or clearing the swamp. LONG LIVE ASSAD. LONG LIVE THE SAA AND LONG LIVE A FREE AND LIBERATED PALESTINE. P.S TIC TOC TO THE INEVITABLE DEMISE OF THE TAKFIRIS. Has any one seen Fats Domino? He has been badly missed here. Is he busy with with asslicking of his masters?